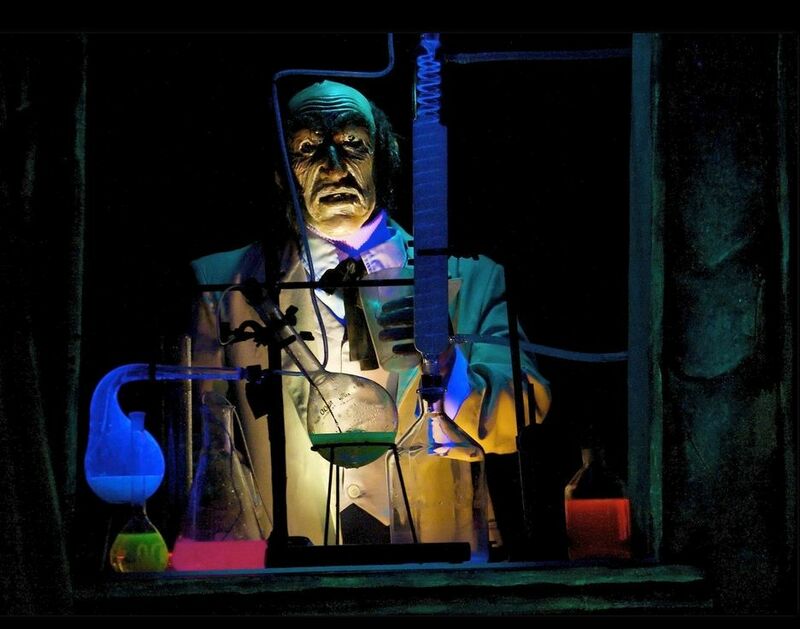 It's time once again to talk about Ken Anderson, celebrated here at Long Forgotten as the "Father of the Haunted Mansion" in four consecutive posts back in 2010. Those were followed by a fifth post detailing his extraordinary blueprint for a walk-thru Mansion that contained traces of his own show-flow sketch work. This post certainly belongs with that collection. 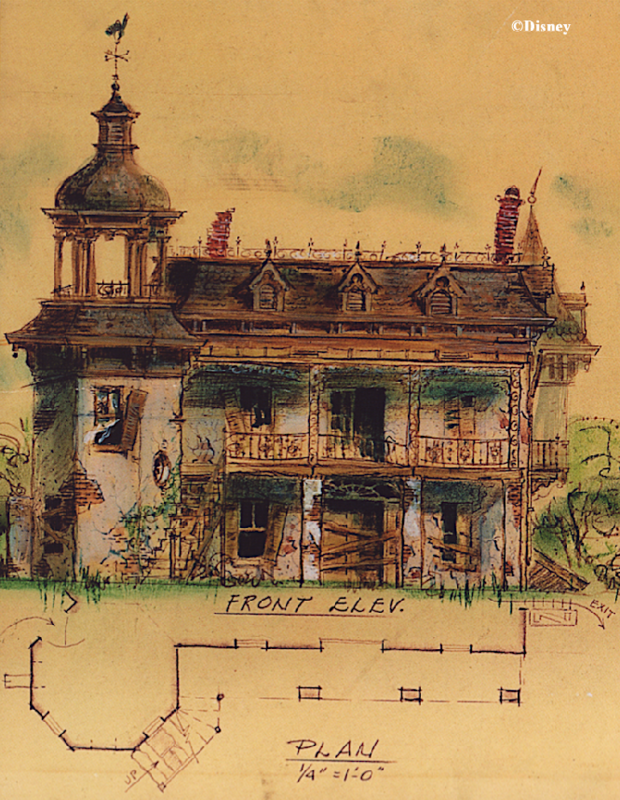 A remarkable relic of Haunted Mansion history has recently come to light. 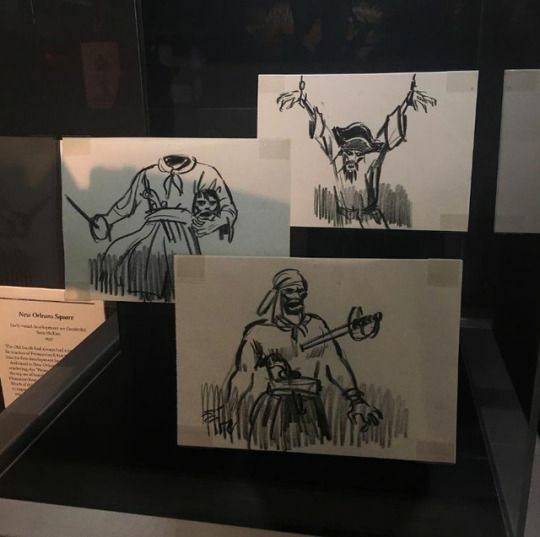 It was a document posted at the D23 Expo (July 14-16) in the POTC section, seemingly without realizing what it actually was. 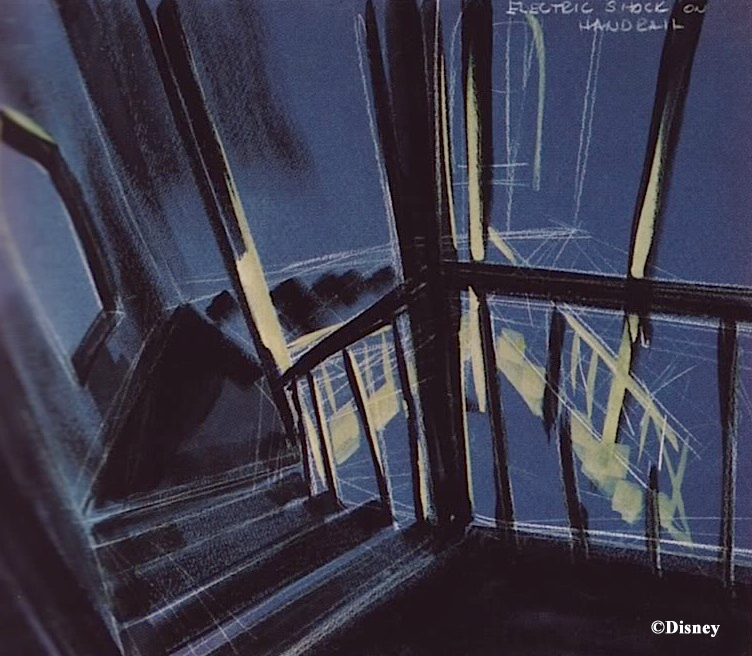 It was a Ken Anderson layout sketch of his "Ghost House" walk-thru, reflecting the very first of his backstory concepts. 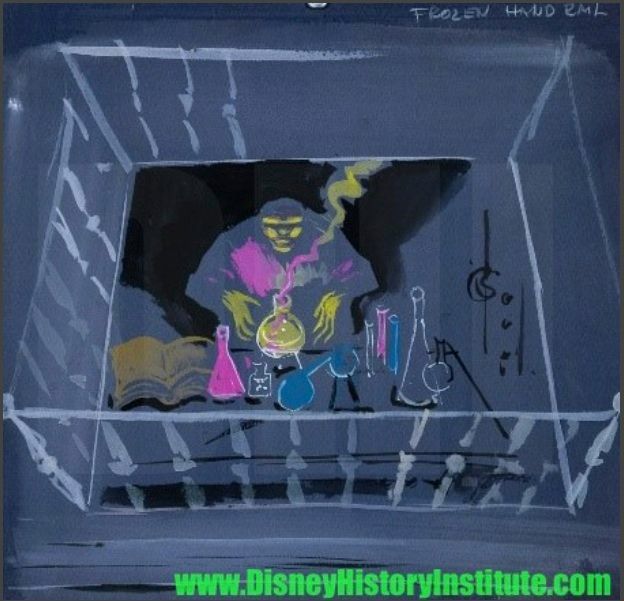 If you know your HM history, you know that in 1957 Anderson came up with no less than four show concepts in rapid-fire succession. 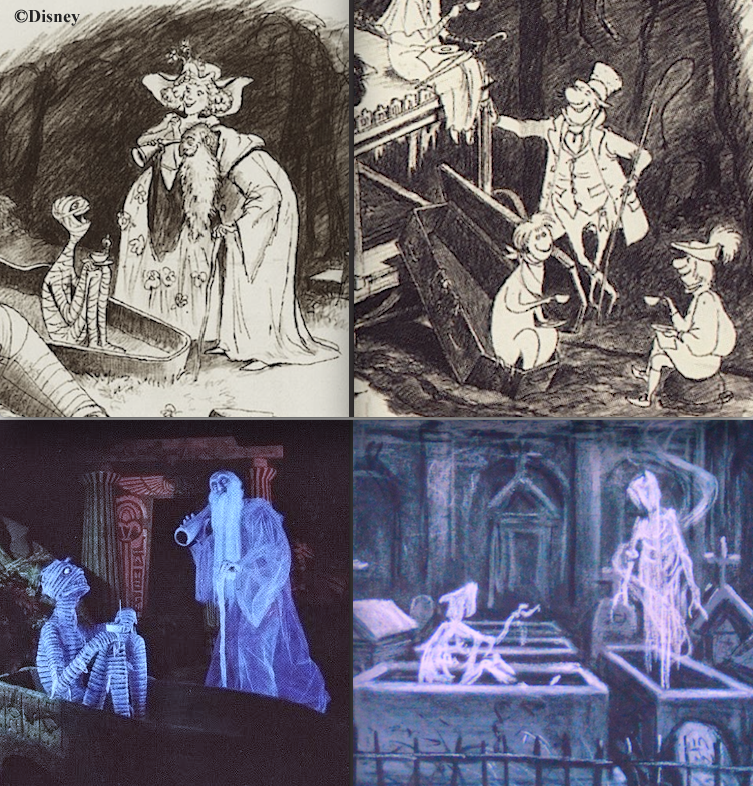 The first was the infamous "sea captain" tale, still recalled whenever folks want to discuss what the "real" backstory of the Haunted Mansion is. The write-up for this version was only a brief, sketchy summary, and until now no one has suspected that there was any layout artwork associated with it. "The Gore Mansion" belonged to an old sea captain named Bartholomew Gore who disappeared mysteriously some years ago. Tours of his house commence in a Portrait Gallery, where "Beauregard the Butler" explains that Gore married in 1810 and brought his new bride Priscilla to live in his home. Priscilla was concerned about local rumors that Gore was really a bloodthirsty pirate, and on their wedding night she broke into an old treasure chest belonging to her husband and discovered from its contents that indeed her hubby was the notorious pirate Black Bart. ("No one knows what happened to Priscilla," says Beauregard, "but she was never seen again—alive, that is. And after that ghastly night, Captain Gore knew no peace.") He found out about her discovery, murdered her, and bricked her up in a cellar wall. But the ghost of Priscilla drove Gore mad, and he hanged himself. The house is now reputedly haunted by both ghosts. This sketchy concept was written up in several drafts, each new one incorporating some changes. Gore's name was altered to "Gideon Gorelieu," and "Captain Gore" then became only a nickname given him by the locals. In another draft he kills Priscilla and locks her in a chest (or kills her by locking her in a chest), and then throws the key down a well. In yet a third draft he throws her into the well. In that version, the well is seen outside, and there's some childish writing scratched on a wall nearby ("Ding dong dell, Priscilla's in the well. Who threw her in? The wicked cap-a-tain!") The butler explains that the water in the well is always blood red—or is it merely a reflection of the sun? Logistically, the tour was to begin, as already noted, in a Portrait Gallery. 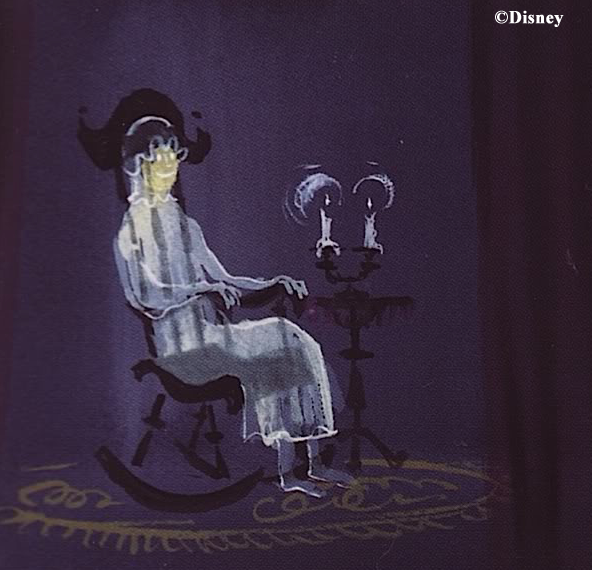 In the next room, Priscilla's ghost was to be seen in a rocking chair. Next we had a scene showing her breaking into the trunk. Subsequent scenes are apparently not described in individual detail, but we would have picked up any necessary remaining information from them. 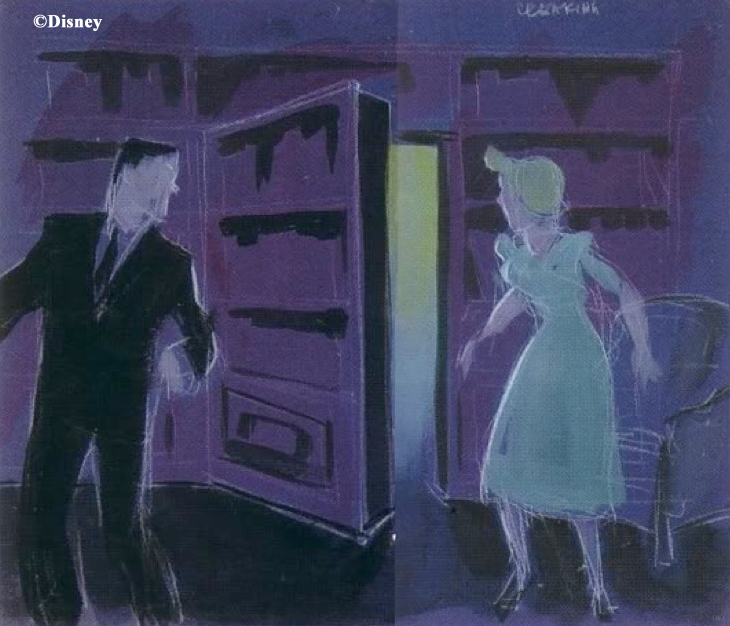 The scenes were all going to be "store window" type tableaux that lit up before the guests (about 40 people at a time) and then grew dark again, signaling that the group needed to move on to the next. 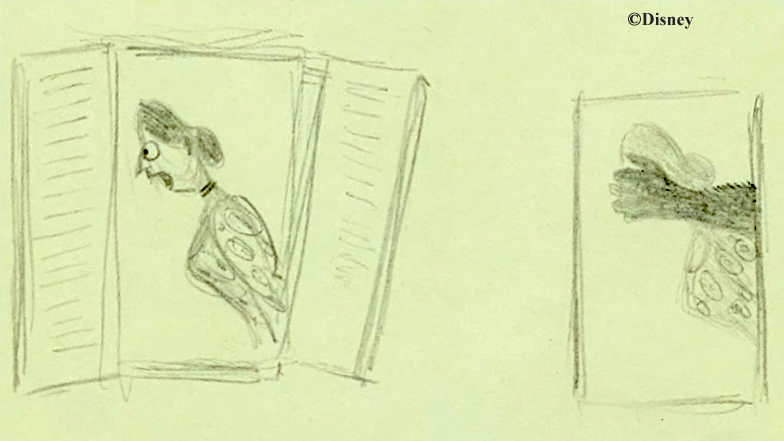 What we see in the newly-discovered drawing not only follows the outline of "The Legend of Captain Gore," it reflects a version pre-dating the changes to the storyline found in the second and third drafts. Keep in mind that Anderson's second Ghost House concept, "Bloodmere Manor," appeared in March, so the time frame for all of these "Captain Gore" drafts is one month at most. 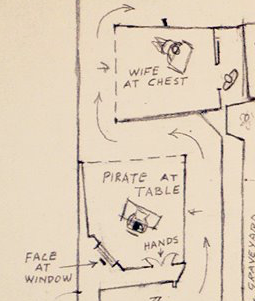 Moreover, some drafts of "The Legend of Captain Gore" apparently include plans for a possible conveyance device, a sinking platform that rolls like a cart around the house. The sketch above has none of that yet. In fact, the guests go up when they enter the building, not down. Most curious of all, there are elements in it that are not reflective of any of the "Captain Gore" drafts. 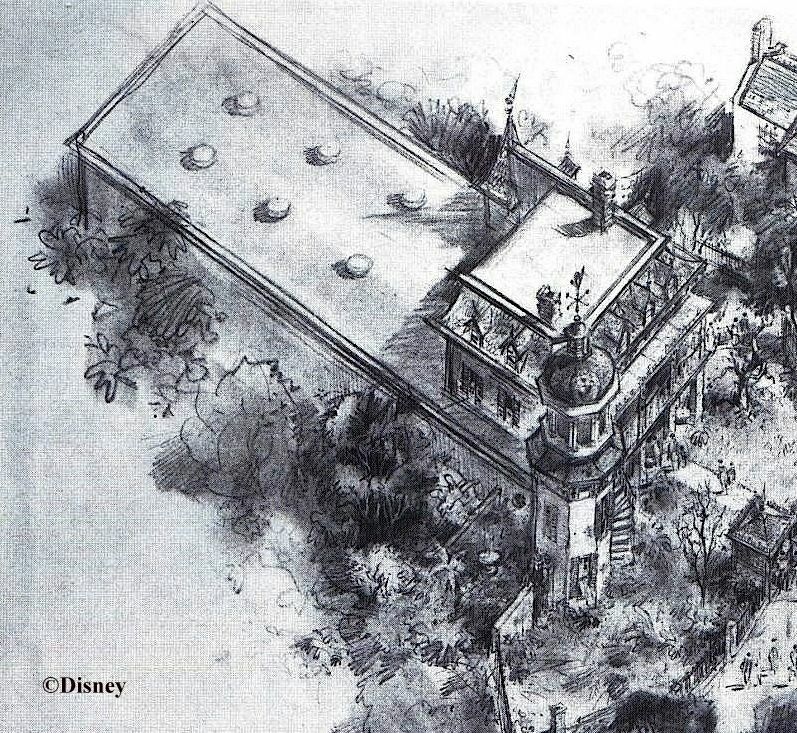 What all this means is that this sketch is even earlier than the earliest known written summary of Anderson's first Ghost House concept. 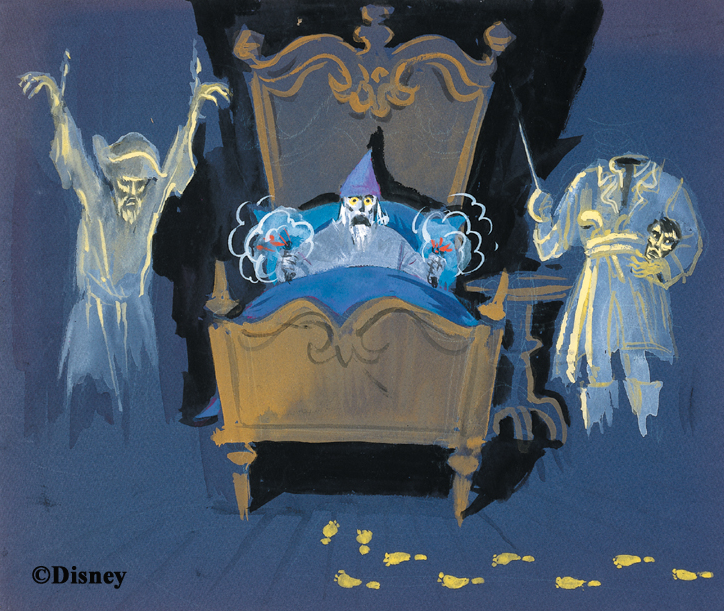 It therefore represents the oldest known plan for Disneyland's haunted house. Anderson was already at work on it in January of 1957 at latest. If Anderson was putting his Ghost House walk-thru into this building, he must not yet have discovered the Shipley-Leydecker house in Baltimore, which he sketched and which instantly became the model for the building that eventually went up. That discovery must have happened sometime between January of '57 (when this newly discovered "blueprint" was apparently rendered) and September of that same year, when Anderson sketches reflecting the Shipley-Leydecker design begin to appear. 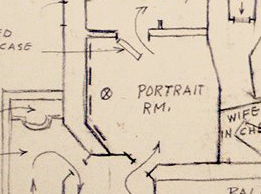 One or two pieces of Ken's concept artwork can now be identified as belonging to this archaic 1957 plan. Other pieces may or may not belong to it, but we're going to take a tour of the house as best we can, using what we've got. it in campy horror movies from Cat and the Canary to House on Haunted Hill. I notice that the PORTRAIT ROOM does not yet include a fireplace anywhere. 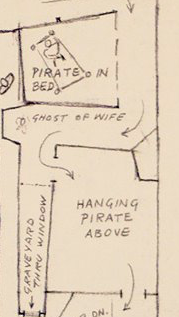 All of Anderson's known sketches for this room have one. Oh well. 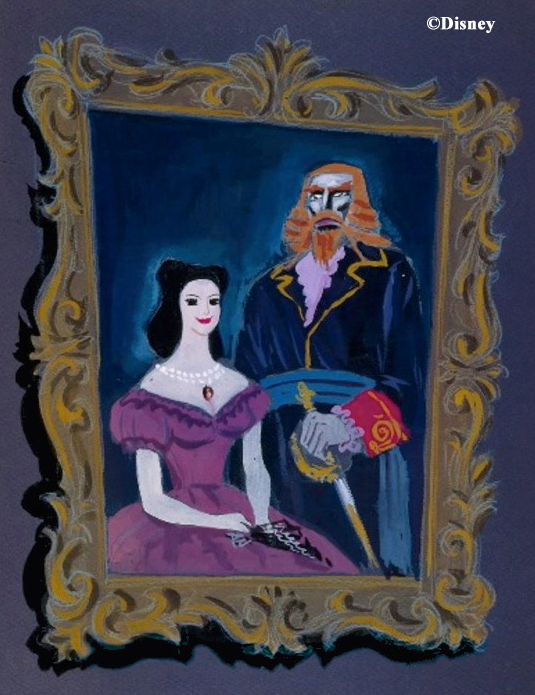 The butler would no doubt have pointed out here a portrait of Captain Gore and Priscilla, which Anderson rendered more than once. 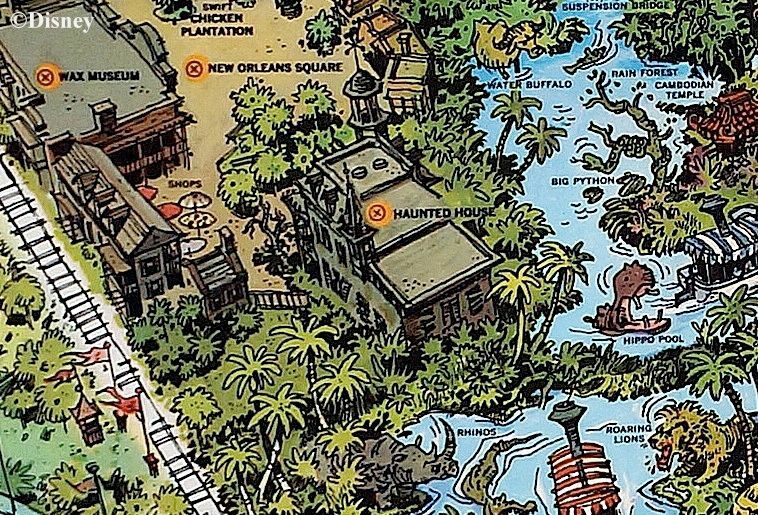 The map, however, shows instead of this a tableau with PIRATE AT TABLE. We can only guess what was supposed to go on there. There is a FACE AT WINDOW and a pair of grabby HANDS (probably) coming out of a trap door on the left. 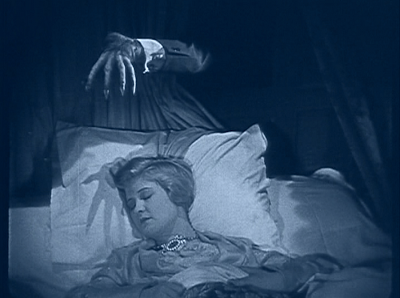 The hands, of course, show up in later versions as "Hairy the Arm," but at this point they are unexplained. It looks like Gore has a document in his hands. A treasure map, perhaps? What needs to be established story-wise at this point is the awful truth about Gore's secret life as a pirate, and the label "Pirate" here indicates just that. By the way, it looks like Anderson changed his mind about which wall would be open to view. See the little arrow? The WIFE AT CHEST tableau requires little explanation at this point. It looks like a Gore figure was going to swing around and appear in the doorway. At that point Pris would scream, and the room would be plunged into darkness. 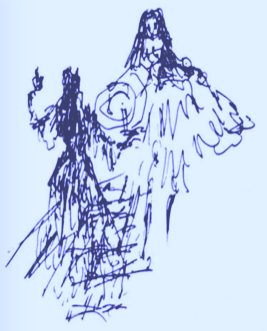 There is an ambiguous sketch Anderson did in 1992 for The "E" Ticket magazine that may be a depiction of the moment of confrontation. 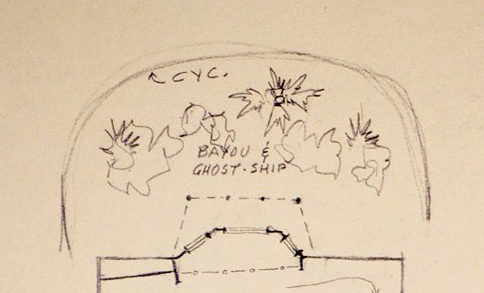 a CYCLORAMA featuring a BAYOU and a GHOST SHIP? 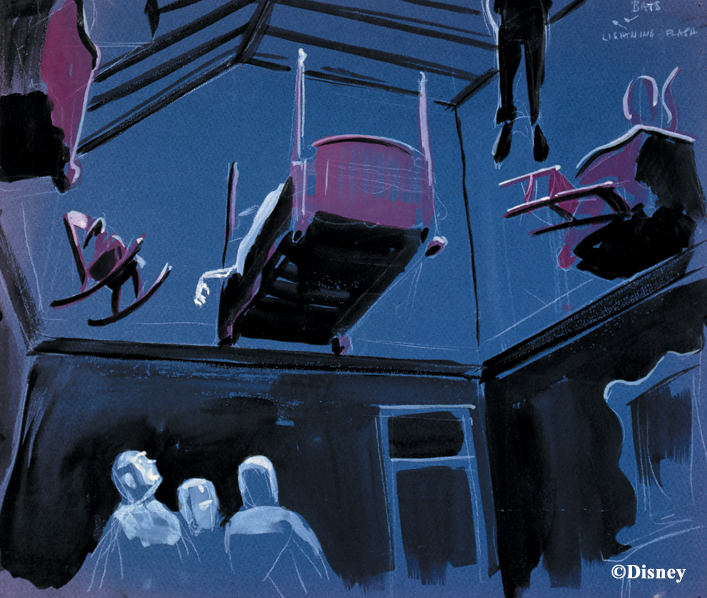 A similar cyclorama shows up in a later blueprint for Ken's Ghost House, the one reflecting the fourth concept (the Headless Horseman). I can exorcise all of that deviltry for you, but you'll have to supply the ghost ship from your own imagination. 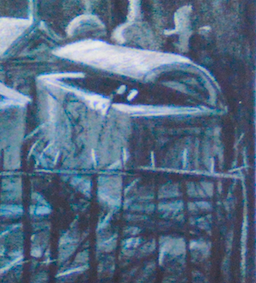 The GRAVEYARD THRU WINDOW at the end of a long hall behind glass is intriguing. There must be a reason for the long passage, but whatever special effect was envisioned here, we can't recover it from the drawing. 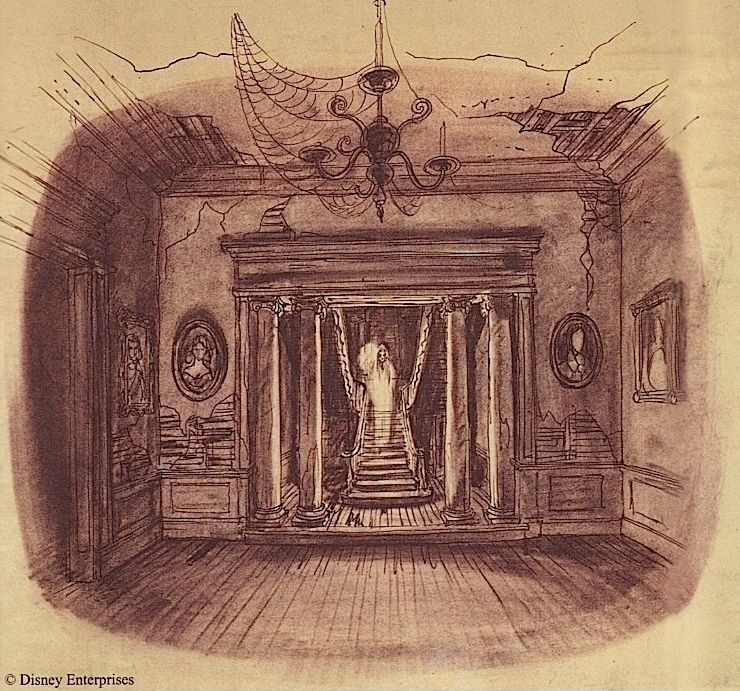 Anderson did more than one graveyard sketch, but it seems to me that this is the one most likely to have been associated with this early version of the Ghost House, if any of them are. Sure, it's a doorway not a window, but did you notice the ghost in the chest? 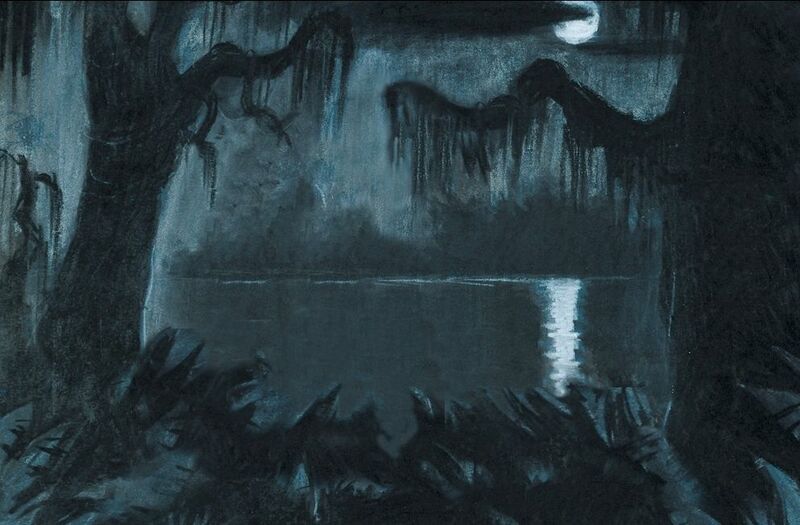 Notice too the bayou atmosphere. The sketch is thematically appropriate, anyway. 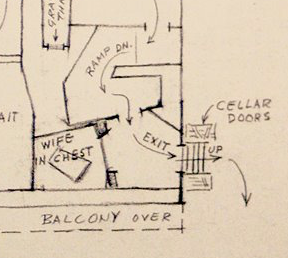 We wind our way down a RAMP into a cellar area, where we eventually see through an opening in the wall the unfortunate WIFE IN CHEST. The wall here is noticeably thick, suggesting that this is the place she is about to be (or was) bricked up. It's not indicated on the plan, but one can imagine the importance of sound effects as part of the show here. 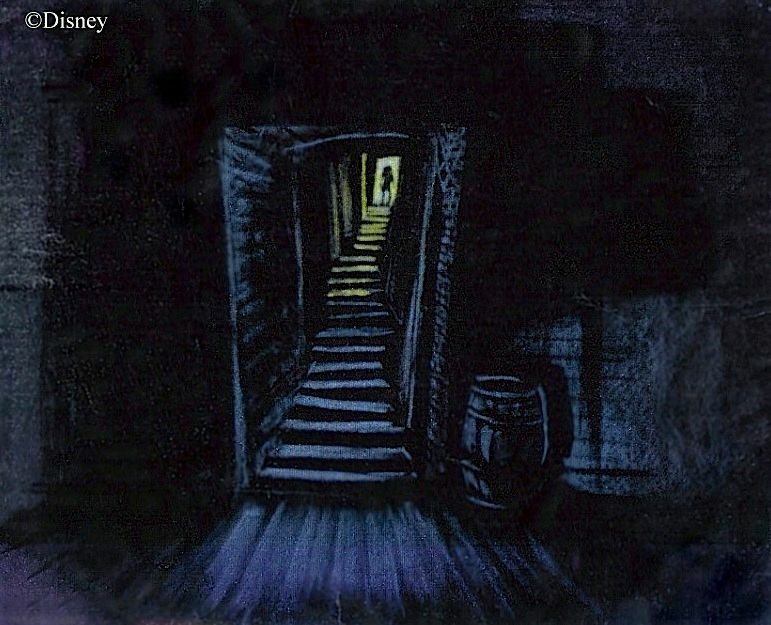 The two sketches below are certainly not related to this HM concept directly, but they at least give us some idea of what Anderson conjured up when he was looking for a "creeping-around-in-a-dark-old-cellar" atmosphere. 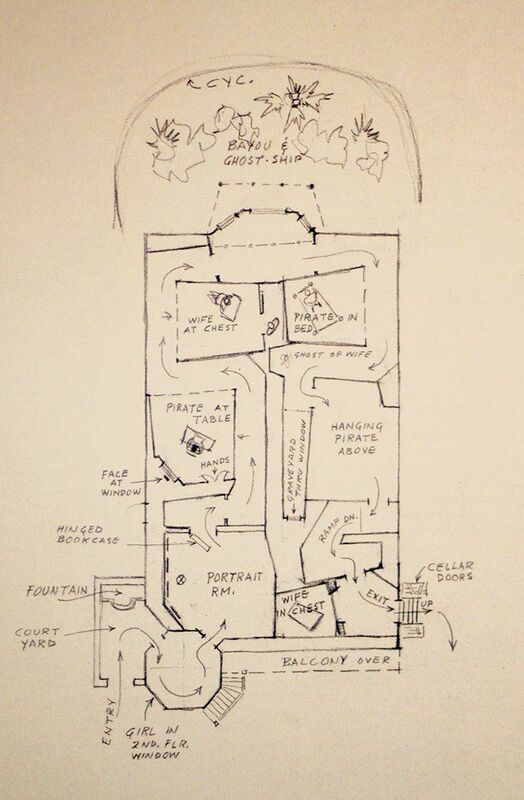 Notice the odd, irregular, "fun house" angles common to both the artwork and the house plan. As we have observed in another context (the Corridor of Doors), depriving your subconscious mind of predictable architectural dimension translates into a sense of exaggerated size (in other words, if the walls are goofy, you remember it as bigger than it is). 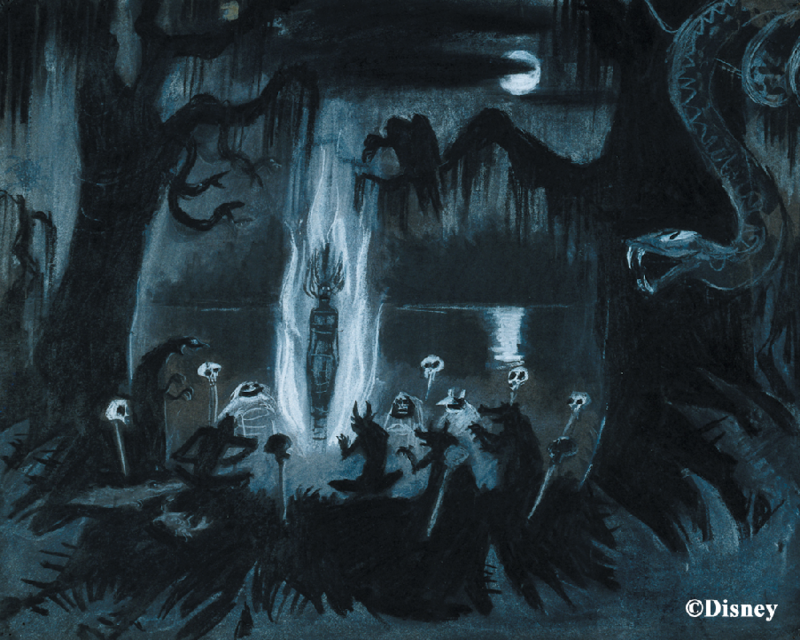 For me, one fun thing about this new discovery is the way it eerily foreshadows the sort of POTC-HM mashup that forms the subject of one of this blog's most popular posts. 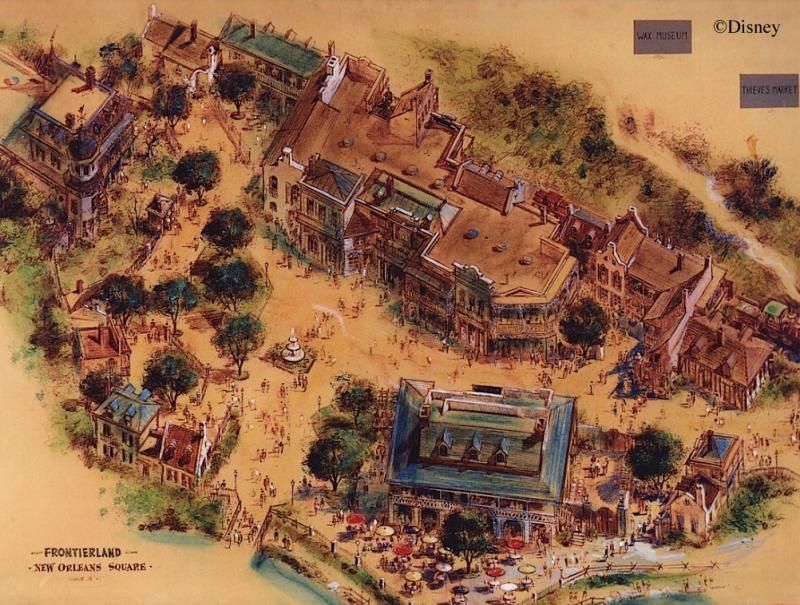 Disneyland's haunted attraction and its pirate attraction were born joined at the hip, just a year and a half after the park had opened. 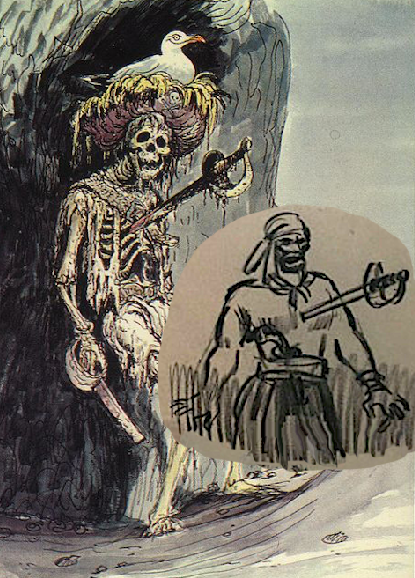 For example, one of the "ghastly scalawags" in one of the Anderson sketches displayed at the D23 Expo could easily have inspired the skewered skeleton on the POTC beach. 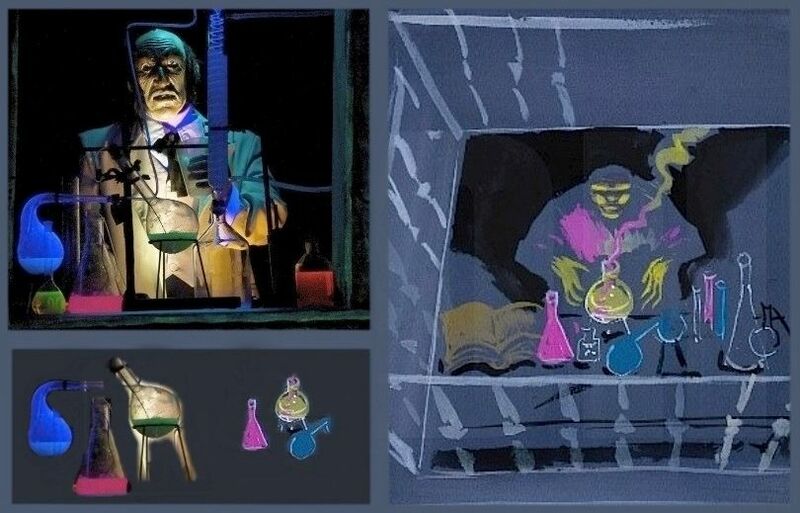 Another thing is how it seems like every time I look through Anderson's artwork I see further examples of his influence on the finished attraction. 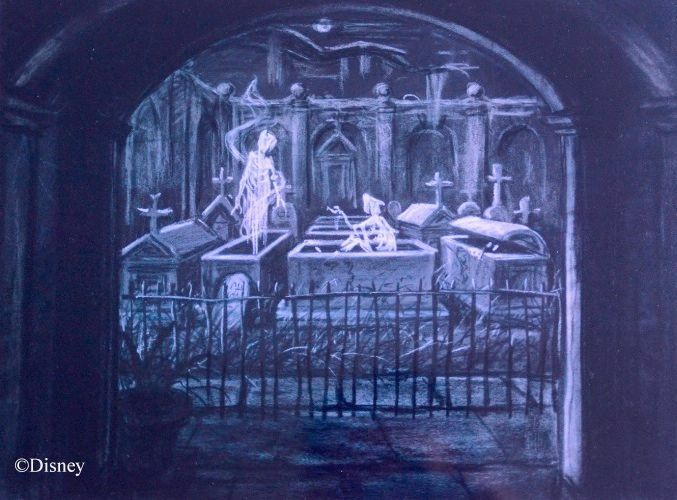 Is it too fanciful, for example, to see in his mausoleum sketch the dim beginnings of some of the graveyard scenes in the finished ride? It's also fun to see how Anderson's work continues to influence generations of new Imagineers. 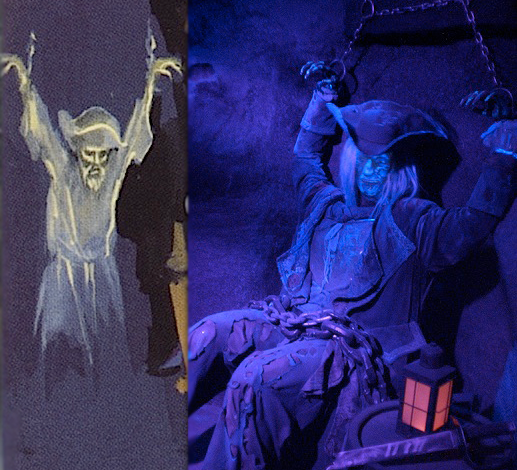 For example, if the 1957 pirate-ghost-in-chains in the earlier sketch looked familiar, it should. 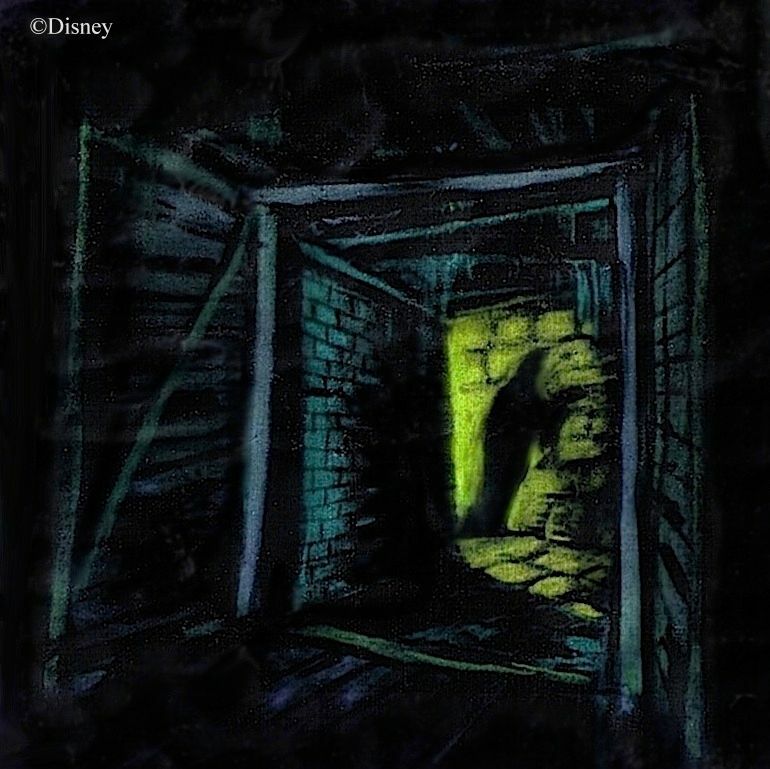 It served as a template a half century later for a 2007 pirate ghost on DL's Tom Sawyer Island. Ah, Ken . . . you still da man.